The National Day of Prayer (36 U.S.C. §119) is an annual day of observance held on the first Thursday of May, designated by the United States Congress, when people are asked "to turn to God in prayer and meditation". 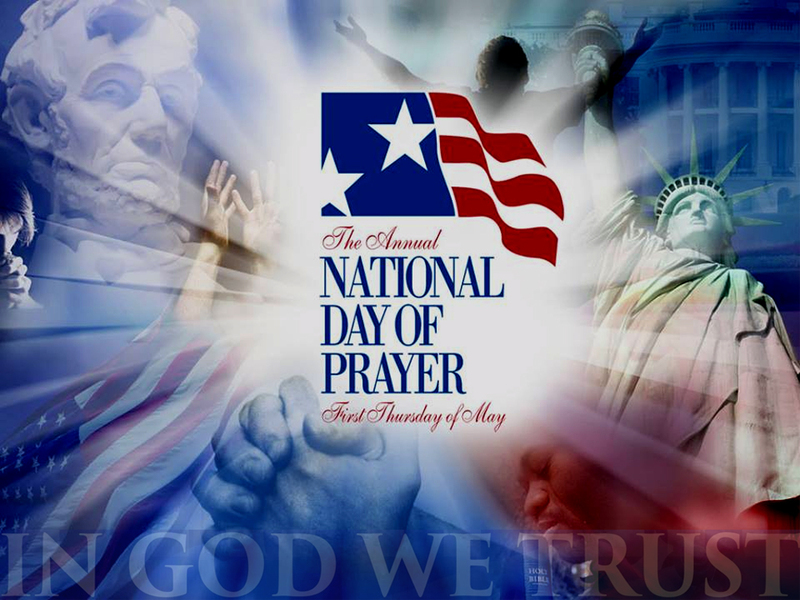 Each year since its inception, the President of the United States signs a proclamation, encouraging all Americans to pray on this day. The observance of a day of fasting and prayer was brought to all of the colonists by the Continental Congress in 1775. Congress issued a proclamation recommending "a day of publick [sic] humiliation, fasting, and prayer" be observed by the "English Colonies" on Thursday, July 20, 1775, "and to bless our rightful sovereign, King George the Third..." The text, written by John Witherspoon and John Hancock, instructed the colonists to pray for a resumption of "the just rights and privileges of the Colonies" in "civil and religious" matters. A proclamation to this end was sent to every town in the colonies. John Adams wrote that the popular response was gratifying, that the special day was more widely observed than the practice of going to church on Sunday. After this success, Congress determined to call for a day of fasting and prayer each spring, and a day of thanksgiving and praise each fall. George Washington prayed often to God. He also maintained a prayer journal. "O eternal and everlasting God, I presume to present myself this morning before thy Divine majesty, beseeching thee to accept of my humble and hearty thanks, that it hath pleased thy great goodness to keep and preserve me the night past from all the dangers poor mortals are subject to, and has given me sweet and pleasant sleep, whereby I find my body refreshed and comforted for performing the duties of this day, in which I beseech thee to defend me from all perils of body and soul." George Washington. The National Day of Prayer shares common roots with the celebration of Thanksgiving; both were national proclamations establishing a day of prayer, but in the New England Colonies under British rule, traditional observances in late fall called for prayer and thanksgiving, while observances in the spring or summer called for prayer and fasting. The fall observance was established by President Abraham Lincoln as the official Thanksgiving holiday in 1863. The spring observance was established by President Harry S. Truman in 1952 as the National Day of Prayer.